Houston was homebase to a remarkable cadre of red-hot blues guitarists during the 1950s. 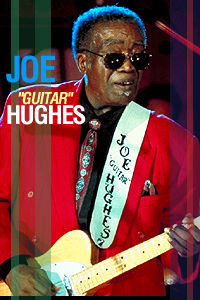 Joe Hughes may not be known as widely as his peers Albert Collins and Johnny Copeland, but he's a solid journeyman with a growing discography. Another of his Houston neighbors, Johnny "Guitar" Watson, lit a performing fire in Hughes when he was 14. Lone Star stalwarts T-Bone Walker and Gatemouth Brown also exerted their influence on Hughes' playing. His path crossed Copeland's circa 1953 when the two shared vocal and guitar duties in a combo called the Dukes of Rhythm. Hughes served as bandleader at a local blues joint known as Shady's Playhouse from 1958 through 1963, cutting a few scattered singles of his own in his spare time ("I Can't Go on This Way," "Ants in My Pants," "Shoe Shy"). In 1963, Hughes hit the road with the Upsetters, switching to the employ of Bobby "Blue" Bland in 1965 (he also recorded behind the singer for Duke) and Al "TNT" Braggs from 1967 to 1969.